So here’s a quick run down of the drama of the day. Weeks of self-imposed house arrest were taking their toll. There’s only so much pasta, bagels and club energise one person can take. Honestly will not be touching any of the aforementioned substances until at least 2010. Finally after lots of waiting, it was Monday morning and time for the big day. I don’t think I’ve ever been up at 6.45 on a bank holiday Monday – unless it was a continuation of a previous evening’s debauchery. That definitely wasn’t the case yesterday morning. Half a bagel later (couldn’t face a whole one), last few checks to make sure all essential items were in place and out the door for the luas into the starting line. We got to the starting pens around 8:30 to find a sizable crowd already in place. Commence some swift stretching and some last minute toilet trips and then it was into the breach along with the other 12,748. Think the Garda Band were on duty and someone also belted out the National Anthem just before the gun went off. Hairs on backs of necks stuff. Then before you knew it, we were off. The feet and body in general were bouncing along nicely for the first 3 or 4 miles around North Dublin. In the distance I spotted the Black pacer balloons come into view. 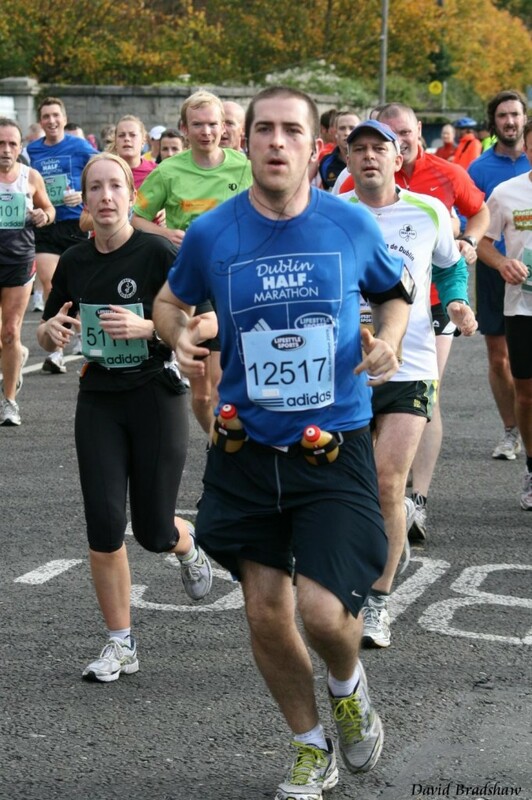 Slow down Colm I thought to myself – they are the 3.45 or 3.30 pacers. As I got nearer to them jogging down North Circular Road and my crap eyesight finally was able to make out the time on the balloons I was shocked to realise they were the 4hour pacers! Hmm, I was running a slow pace it seemed after all. So head went down going into Phoenix Park. Quick toilet break later and I was hot on the heels of the 4 hour pacers. I passed the 4 hour pacers mid way though the Phoenix Park and was determined to get a few minutes ahead of them knowing I would probably crash and burn over the last 6 miles. The run through the park was beautiful. Someone clearly has a direct line with the weather Gods as it seems the wind and rain was paused for the duration of the marathon and the 6 hours either side of it. The sun was out and it suddenly felt like the middle of July! So out of the park we went and up towards Crumlin. There is a very nasty climb there which I wasn’t prepared for. Took the wind out of the sails a bit. Nevertheless onwards and upwards. Shortly afterwards passed the first of our cheerleaders for the day. You know who you are. Honestly, having someone come out to support you on a day like this is what really makes it extra special. It was somewhere a little further up the road that the backs of the knees started giving out. New pains here. Feck. Think I took off too quickly after passing the 4h pacers. Completed 13.1 in 1h55m – not a bad recovery from the first few miles and yes I had been running too fast to compensate for the slow start. So I backed off and slowed the pace down. I also took my first gel (ever). Woah – instant energy boost – these things really work. I went against all accepted wisdom about NOT experimenting with new variables on the big day and it was a risk but it paid off. Cramps gone. Energy in overdrive. Happy Days. I made a quick pitstop again at mile 15 (thank God they have portaloos on the course) and back on the road. Had a really good spell then from 15 through to Milltown (more cheerleaders in Milltown – thanks guys) and up towards Clonskea. The legs then started to get a bit tired. Turning back up towards UCD and the long steady climb of Nutley Lane was a killer – an absolute killer. The locals were out in force like the know the hill well and their support was dragging people up the hill. Then a nice long descent. Then on to Stillorgan dualer. Up again over UCD flyover – honestly you’re just making us go up hills now. It got very tight down the right hand side of the dualer back towards the Merrion turnoff. More downhill – nice. General fatigue is really kicking in now. Debating whether to take my last gel at this point or to hold it for Mile 22/23. Just then I spot someone giving out the High5 gels. It’s not my usual (i know I’ve only taken 2 in my whole life and that was in the previous 2 hours but you know the way) Powerbar gel brand but I knock it back ending my previous debate. Jeasus it was nasty! Didn’t get the same kick as with the Powerbar ones. Fatigue still weighing me down. Now is the time you have to dig deep and look for something extra. You start creating little mini-goals to keep you focused on the task at hand. Little by little you keep getting closer to the end. Every time little doubts creep in you squash them as best you can with more mental games and positive thoughts. Only 3 miles to go – sure that’s nothing. Now it’s time to eat every little bit of sugar in sight (feeling sick) knock the last gel and guzzle yet more water and energise. Over the Grand Canal Bridge and on to Grand Canal Street. Our cheerleaders have made it back into town and they’ve added a few more familiar faces. A combination of the last gel, our cheer leaders and the general increased crowds activate the afterburners and the new lease of life now has me tearing home. Rounding the last corner at Grafton Street and Nassau Street is a truly amazing sensation. 3h something on the clock. Foot down. Full on sprint it is. I don’t remember much after that other than lots of noise and a blur of faces in the crowds. I nearly ran into some other girl who was crossing the line just in front of me. In hindsight I might have slowed down to truly take in the last few hundred yards and crossed the line with no one else tumbling over the line beside me. Feck that. Nothing was stopping me getting over that finish line as soon as possible! Relief, joy and massive sense of achievement as you might expect. But also a sense that you’ve just experienced something you’ll never experience again – no matter how many marathons you run in the future. In fact, I’d say the toughest thing about running a marathon is not the race itself but the preparation that goes into it. Hell, the first time I ran 20 miles was probably tougher than the actual marathon. It’s all well and good running a race with thousands of people to spur you on but it’s a whole other matter to get off your arse on a Sunday morning in the wind and rain and put in 3 hours on your own with just the ipod for company. There were times yesterday were the miles just melted away almost too quickly if that makes any sense! I know it doesn’t even make sense to me! Well chuffed to have finished at all.